The First Jewish–Roman War (66–73 CE), sometimes called the Great Revolt. The crisis escalated due to anti-taxation protests and attacks upon Roman citizens. The Roman governor, Gessius Florus, responded by plundering the Jewish Temple, claiming the money was for the Emperor, and the next day launching a raid on the city, arresting numerous senior Jewish figures. The Jews worked to become Roman citizens under any title or religion firstly to avoid paying taxes; and ultimately to become part of the authorities in Rome and in its colonies. And they succeeded in both. Now, the Jews and Israelis feel being Italians. The affiliation of Jews with the rest of Europe came through the Italian (Roman), and also Slavic/Germanic, connections. The Romans reaction to the Jewish rebellion can be understood from the integration of people like Josephus into the Roman Empire. The main account of the revolt comes from Josephus, the former Jewish commander of Galilee who, after capture by the Romans after the Siege of Yodfat, attempted to end the rebellion by negotiating with the Judeans on Titus’s behalf. Josephus and Titus became close friends, and later Josephus was granted Roman citizenship and a pension. He never returned to his homeland after the fall of Jerusalem, living in Rome as a historian under the patronage of Vespasian and Titus. Scholars agree that the rabbis replaced the High Priest’s role in Jewish society after 70 CE. In the absence of the Temple, the synagogue became the center of Jewish life. The Jewish demographics changed, as many of the Jewish rebels were allegedly scattered (actually infiltrated into various Roman regions and institutions) or sold into slavery (a ridiculous baseless claim). Josephus claims that 1,100,000 people were killed during the siege (a clear total lie). Hellenistic rulers of Judea. Under the suzerainty of the Ptolemies and later the Seleucids, Judea witnessed a period of peace and protection of its institutions. For their aid against his Ptolemaic enemies, Antiochus III promised his Jewish subjects a reduction in taxes and funds to repair the city of Jerusalem and the Temple. Relations deteriorated under Antiochus’s successor Seleucus IV, and then, for reasons not fully understood, his successor Antiochus IV Epiphanes drastically overturned the previous policy of respect and protection, banning key Jewish religious rites and traditions in Judea (though not among the diaspora) and sparking a traditionalist revolt against Greek rule. Out of this revolt was formed an independent Jewish kingdom known as the Hasmonaean Dynasty, which lasted from 165 BCE to 63 BCE. The Hasmonean Dynasty eventually disintegrated due to civil war, which coincided with civil wars in Rome. The Hasmonean civil war began when the High Priest Hyrcanus II (a supporter of the Pharisees) was overthrown by his younger brother, Aristobulus II (a supporter of the Sadducees). A third faction, consisting primarily of Idumeans from Maresha, led by Antipater and his son Herod, re-installed Hyrcanus, who, according to Josephus, was merely Antipater’s puppet. In 47 BCE, Antigonus, a nephew of Hyrcanus II and son of Aristobulus II, asked Julius Caesar for permission to overthrow Antipater. Caesar ignored him, and in 42 BCE Antigonus, with the aid of the Parthians defeated Herod. Antigonus ruled for only three years, until Herod, with the aid of Rome, overthrew him and had him executed. Antigonus was the last Hasmonean ruler. The Hellenization of the Jews in the pre-Hasmonean period was not universally resisted. Generally, the Jews accepted foreign rule when they were only required to pay tribute, and otherwise allowed to govern themselves internally. A period of political intrigue followed, with priests such as Menelaus bribing the king to win the High Priesthood, and accusations of murder of competing contenders for the title. The result was a brief civil war. The Tobiads, a philo-Hellenistic party, succeeded in placing Jason into the powerful position of High Priest. Some Jews are known to have engaged in non-surgical foreskin restoration in order to join the dominant cultural practice of socializing naked in the gymnasium, where their circumcision would have been a social stigma. In 164 BCE, Judah captured Jerusalem and the Temple in Jerusalem was freed and re-consecrated. After five years of war and raids, Judah sought an alliance with the Roman Republic to remove the Greeks. The Jews in the diaspora were generally accepted into the Roman Empire, and they played major roles in the formation of Roman Christianity. Jewish communities were thereby largely migrated from Judea and went to various Roman provinces in the Middle East, Europe and North Africa where they prospered and gained substantial powers. 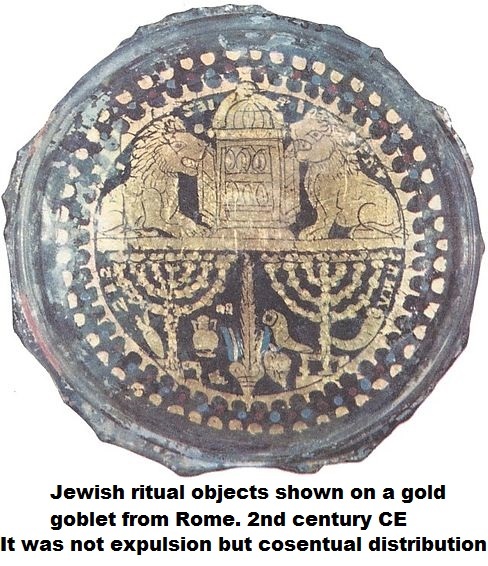 The actual center of Jewish power shifted from Judea to Rome after the Jewish–Roman conflicts of 66–136 CE (70 years). It was not expulsion but consensual distribution. The other major result of the Jewish migration from Canaan was the significant increased concentration of Palestinians in that region. The Palestinians were brought by the Jews from Crete and other Mediterranean regions in exchange for the expelled Hebrew Israelite and Canaanite communities in 530 BC. And, when the Jews left to the various territories of the Roman Empire the Palestinians remained and increased in Canaan.